I installed an original 1970 GSX rear spoiler on my 70 GS. I always wanted a GSX but could not find a 1970 model in my price range so I built one to my specifications. Here is a side view of the spoiler. The stripes are not as original since the outer stripe is 1/4" wide and is 1/4" away from the main stripe. Original GSX stripes had 1/8" space then a 1/8" pin stripe. In my opinion, the 1/8" stripe was too small when viewed from a distance. 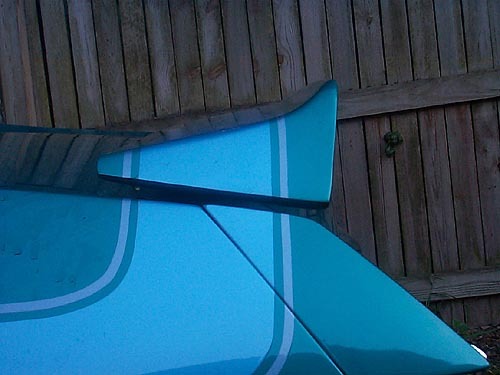 This is a factory original 1970 GSX spoiler with the vent hole located on the bottom side just to the left of center. Hole diameter is 3/16". 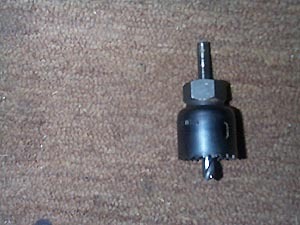 New reproductions do not have this vent hole or the hole is a different diameter. This shows the two access holes to tighten the lag screws that hold the rear wing to the trunk lid. Under the head of each lag screw is a large washer to distribute the load of the spoiler to the surrounding metal with causing any distorion. Some aftermarket spoilers have studs protuding from the pedestal. This is a 7/8" door hole saw available from Home Depot or similar hardware stores. The "KEY" technique when using this tool on the metal deck lid is to go very slow and use plenty of lubricant (WD40, PB Blaster, Motor Oil) to keep the blade cool as it cuts the metal. Remember this tool was designed to cut through wood and not metal so slow and steady speed is important! 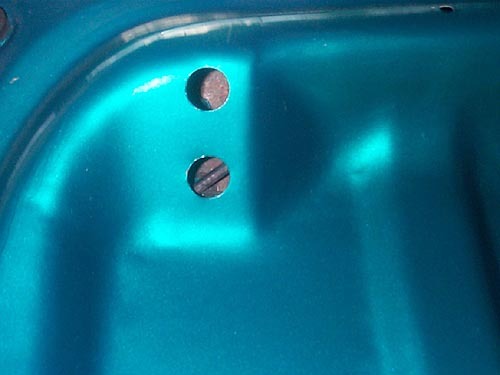 Here is a picture showing the torsion bars that hold the trunk lid open. There are three slots to adjust torsion. With the bar set in the middle slot for my car, this keeps the trunk lid open but really needs to go to the next slot for more torsion (torque) to keep the trunk lid open. On my car, if you just bump/touch the lid it will shut. With aftermarket spoilers, those are supposed to be lighter, approximately 10 lbs. The original spoilers weigh approximately 16 lbs. In order to move the torsion bar to the next slot requires some effort. Use a LARGE screw driver or pry bar to lift the bar up and over to the next slot. You can also use a very LARGE pair of Channel Lock pliers to do the adjustment. DO NOT put your hands near or use your fingers to move the bar over when you raise it up from the slot, the torsion bars have great "spring" forces and can act wildly if the tool loses its hold on the bar. Usually it takes one person to lift the bar up and another to move it to the next slot. It may take several tries. This adjustment must done on both sides of the trunk lid. 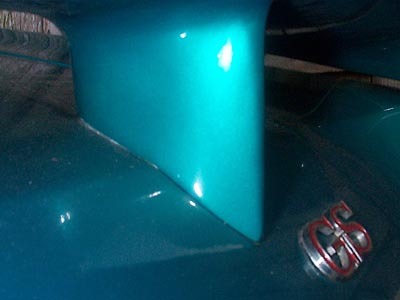 This shows how the contour of the pedestal matches the outline of the trunk lid. 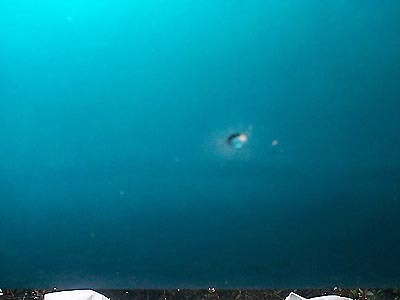 The center of the pedestal is the reference point to take measurements of the holes needed to be drilled in the trunk lid as stated above. Notice there is no gap between the pedestal and trunk lid surface. 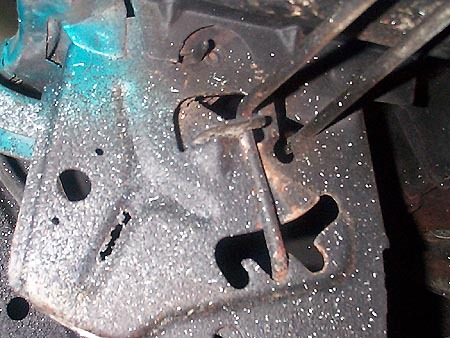 With some aftermarket spoilers, you may need to sand the pedestal base to match the contour.